TBT: So . . . Was I Right about Iraq? Throwback Thursday! Of course. UrbanDictionary.com updates my revelation by noting that TBT may also indicate Throwback To . . . . So every day of the week we can gorge ourselves with impunity on grainy images of our unfortunate 1980s hairstyles. I love it. Since I got my hair cut roughly the same way today as I did thirty years ago, I don’t have much to add to TBT in the way of embarrassing photographs. In the process of junk sorting, however, I found an opinion piece I wrote for the Erie Times-News between 9/11/2001 and the U.S. attack on Iraq on 3/19/2003. This particular TBT is short on humor, but it is interesting to revisit old convictions. For the United States, September 11, 2001, was a series of unimaginable sucker punches. In a few hours, terrorists placed on our country’s hearthrug a new reality: the “gentleman’s agreement” as to the rules of war had been altered. The “enemy” isn’t necessarily a specific country anymore, and rather than sticking their chins out for a retaliatory punch, attackers blow themselves up. The question is, how should we respond to this new set of rules—or lack thereof? Or more to the point for me, what is a faithful way of responding to terrorism within our borders? President Bush isn’t hiding his take on the matter. He thinks that the United States, either alone or in cooperation with other nations, should bomb Iraq with the goal of eliminating Saddam Hussein. I haven’t heard any of television’s talking heads dispute the Bush administration’s claims that Iraq supports terrorism, so I guess if we’re going to wage war on terrorism, Iraq is as good a place to start as any. My concern isn’t where the bombing should begin, but when it will (or won’t) end. I don’t pretend to know what course of action will best protect our national interests or rid the world of the fanatical inclination to fly jets into skyscrapers. Even as a pastor, I don’t know that I could win a theological argument for peace. Many intelligent, scripturally literate people believe that the time for seeking peace with terrorists has passed. But I do feel increasingly sure about the voice of my own conscience, and the word I’ve been hearing lately is enough. As I write this, my kids are close by. One is tying up the phone lines by gabbing on AOL, and the other is wearing a pair of goggles and pretending to swim across my study floor. My wife is at a class on home repair. I love these three. Here’s the deal. If we start down the wrenching, potentially endless path of incinerating the world’s sucker punchers, people every bit as dear as my beloved three would also burn because they happen to be in the way. Enough! Enough lives lost. Enough grieving. Enough violence. Like I said, these are only the words of my own conscience. I’m probably wrong and simplistic, but I try to imagine Jesus standing beside me. What would he say? I can’t hear “bomb ‘em” or “acceptable collateral damage” coming from his lips. 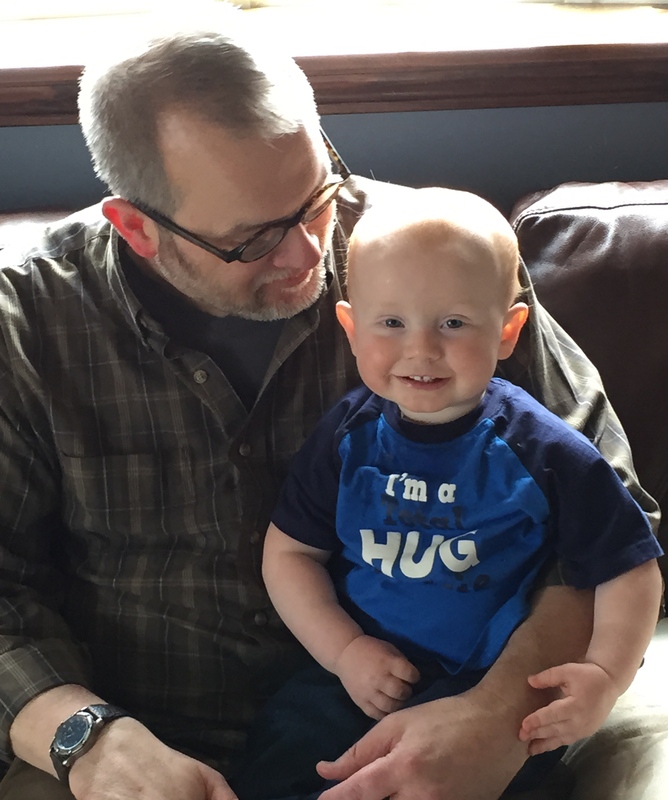 Grizzled and pudgy, I imagine my beloved grandson under the bomb. I guess I’m parked in the same spot I was years ago. I’m in a hotel in Windsor, UK using the free wifi to check my email. Funny that your blog post popped up first thing because yesterday I was in Sherborne with a friend yesterday poking around Sherborne Abbey, where we met a lovely elderly man who sat at a table painting portraits of saints on wood panels. 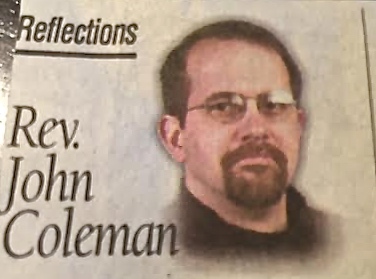 His name was John Coleman. Hey, in case you didn’t get notification, I reviewed your book on Goodreads. Which reminds me, I need to do that on Amazon, too.